Cinco de Mayo should not be confused with Mexican Independence Day. That is September 16th. 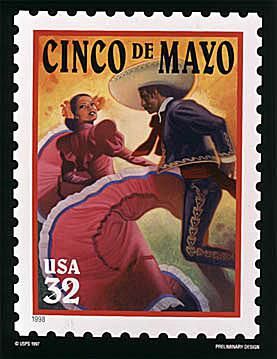 Cinco de Mayo is not a largely observed holiday in Mexico (with the exception of a few regions), but is much more popular in the United States. So, what is Cinco de Mayo? The short answer is that it celebrates the defeat of the French Army by Mexican soldiers at the battle of Puebla. The real answer is that Cinco de Mayo is a uniquely Mexican-American holiday. It celebrates a change in the relationship between the United States and Mexico. The end of the Mexican-American war in 1848, not only left a strained relationship between the two countries but left Mexico deep in debt which grew through the years of civil war. Mexico borrowed money from European countries and eventually, these countries wanted their debts repaid. England and Spain entered the scene and left just as quickly, but France took advantage of their moment and decided to invade. As it turned out, Napoleon III was determined to conquer Mexico, set a Hapsburg prince on a Mexican throne, and rule over Mexico. Some argue that from Mexico, Napoleon wanted to aid the Confederacy in the U.S. Civil War. Exactly what role the French defeat at Puebla played in the U.S. Civil War is debatable, but if the French had supplied the confederacy more actively, the war could have been longer, harder and much bloodier. When the Mexican Army defeated the first invading battalion they were greatly outnumbered and faced with a technologically superior force making the triumph all the greater; the reason it is celebrated today. Ironically, this battle did not end the of the conflict between Mexico and France but was just the beginning. French forces returned a year later in larger numbers and took control of Mexico placing the puppet Maximilian in charge of Mexico. The people of Mexico resisted and once the Civil War ended in the United States, President Lincoln sent General Sheridan to supply the Mexican resistance. Many U.S. soldiers were decommissioned from the Union Army in Texas to join the Mexican Army. A battalion of U.S. soldiers marched in the victory parade in Mexico City when Maximilian was finally defeated in 1868. In honor of the aid provided by the United States, thousands of Mexicans crossed the border to join the U.S. military in the weeks after the attack on Pearl Harbor. It is unfortunate that the real story of Cinco de Mayo remains lost to advertisers who see it as little more than an excuse to sell beer (Cinco de Mayo is now the second largest beer consuming day of the year just behind St. Patrick's Day). It is a celebration of the long relationship between the United States and Mexico, including years of cooperation, and the hope of a future where two neighbors can set aside their differences and work together. So celebrate Cinco de Mayo by remembering why we celebrate it and with a nod to Mexican traditions and foods. Put together a great Molé or a traditional Carne Asada and enjoy the Mexican Grill.